You are currently browsing the category archive for the ‘Quick Tips’ category. Here’s a quick tip to tuck in the old memory bank, just in case you ever happen to win a contest in which an artist paints a portrait of your dog. On the day that the portrait arrives in the mail, it’s a good idea to keep an eye on your other dogs. They might be jealous that you didn’t choose to enter them in the contest. That way, you could prevent a fight, like the one between portrait subject Bailey, and our second dog, Lucy. No less than 2 hours after Carie collected Bailey’s portrait from the mailbox, Lucy struck at Bailey’s moneymaker. A short but heated fight ensued in what can only be the result of Lucy’s jealous fit of rage. It’s certainly not because Bailey occasionally steals her bone. Or because she’s just a little mean. Nope, it surely means that Lucy knows fine art when she sees it, and she can’t stand the fact that she’s not in it. So do yourself and your dogs a favor. 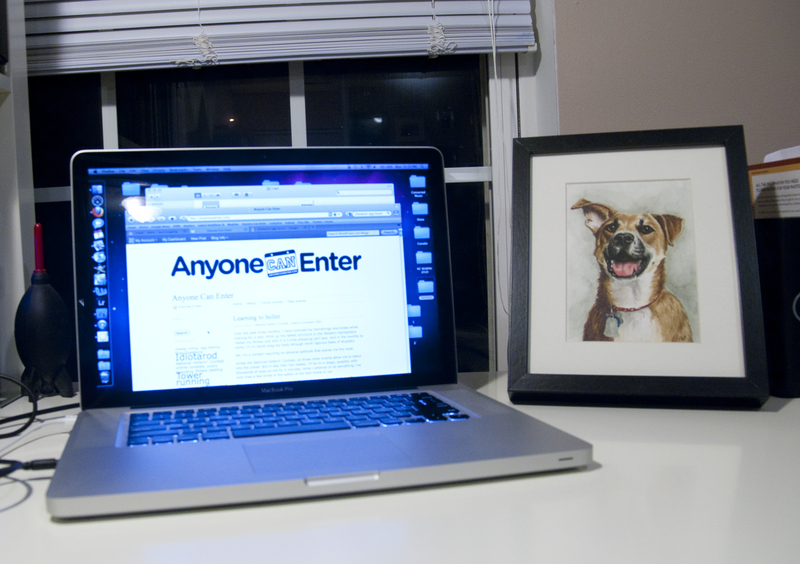 When you win dog portrait contests, maybe keep the portrait somewhere the dogs won’t see it.